I'm ready! Too much snow this winter. We've had snow on the ground since last fall and that NEVER happens around here. Never say "never"! 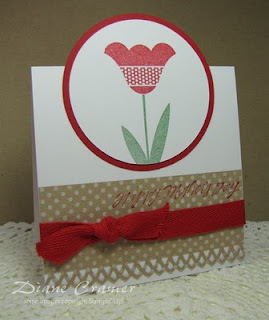 So, in anticipation of spring coming (sometime) I have a couple of cards to share with you. The first one turns out to be a Mother's Day card. (No, my mom doesn't read my blog or check SCS. She is somewhat computer-challenged.) The sketch was a challenge for me. I had to spend a bit of time getting what I wanted. The tulip is PTI's Wishing You set and the greeting is an old SU set called Wonderful Wishes. The kraft paper is dotted with SU's new Dot, Dot, Dot then punched with a Martha border punch. I love the twill tape! It is on a roll in the sewing department at WalMart. I'm going to have to stock up! 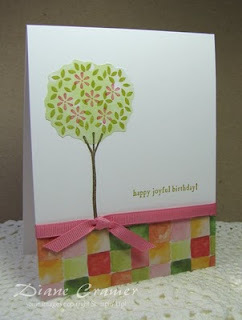 I've been wanting to make some of those really cute trees that are made of patterned paper and cut out. But I don't have the stamps and can't afford them right now. So I made do for this card by using SU's Sheltering Tree on some dotted-watercolor-wash type designer paper I had in my stash. The check paper at the bottom is from Creative Memories. I think it sets the card off well, don't you? Have a wonderful week anticipating the coming of Spring! ahhh so cute, great cards.